MCH is the result of dreams of several proactive citizens of Macon County in the late 70′s and early 80′s. MCH was incorporated in 1982 as a support group for parents, professionals, and others who had an interest in helping persons with disabilities. Once incorporated, the newly formed board of directors wanted to do more and researched the possibility of developing a group home. In 1988, the first group home operated by MCH opened its doors to 5 clients with intellectual and developmental disabilities. Today, MCH has evolved into a service provider known for its high standard of excellence and is recognized throughout the state of North Carolina. All facilities are licensed by the Division of Health Service Regulation. MCH is also CARF accredited. MCH provides residential, AFL, and community-based services in Macon and Jackson Counties. Persons with intellectual and developmental disabilities are also served at Macon Citizens Enterprises, a day program for adults with intellectual and developmental disabilities. Macon Citizens Habilities advocates for and protects the rights of individuals with intellectual and developmental disablities. 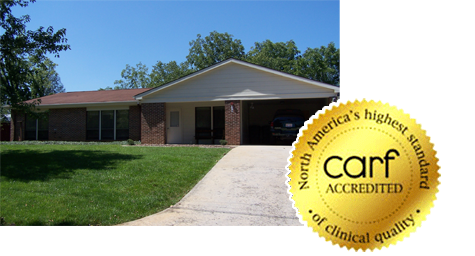 MCH provides comprehensive residential and community-based services. Persons served receive continuous active treatment. The DDA group home serves persons with intellectual and developmental disabilities to become more independent in actives of daily living. ADVP is a day program for consumers who can benefit from prevocational, social, leisure, and activities of daily living training. 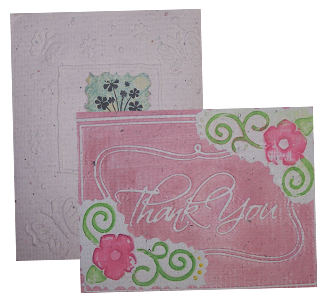 MCH clients create these cards using 100% recycled materials at our day program MCE. 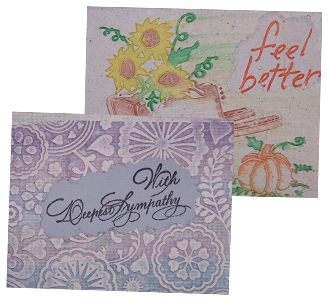 Cards are sold in packs of 5 and include envelopes. Click on the “Buy Now” button below to be taken to our store section.